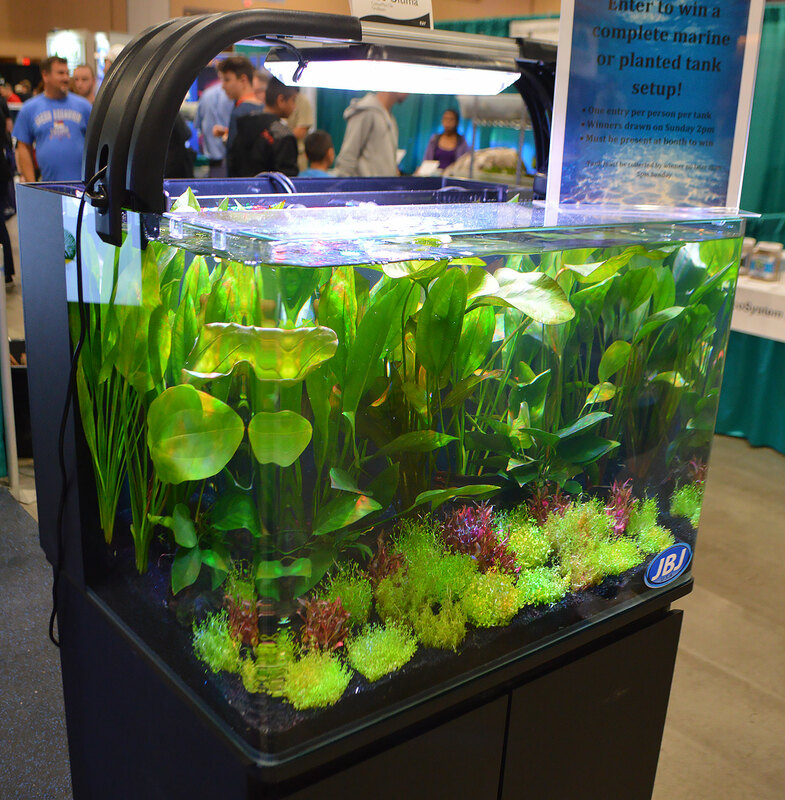 Planted tanks were everywhere at the Aquatic Experience – Chicago, 2016. 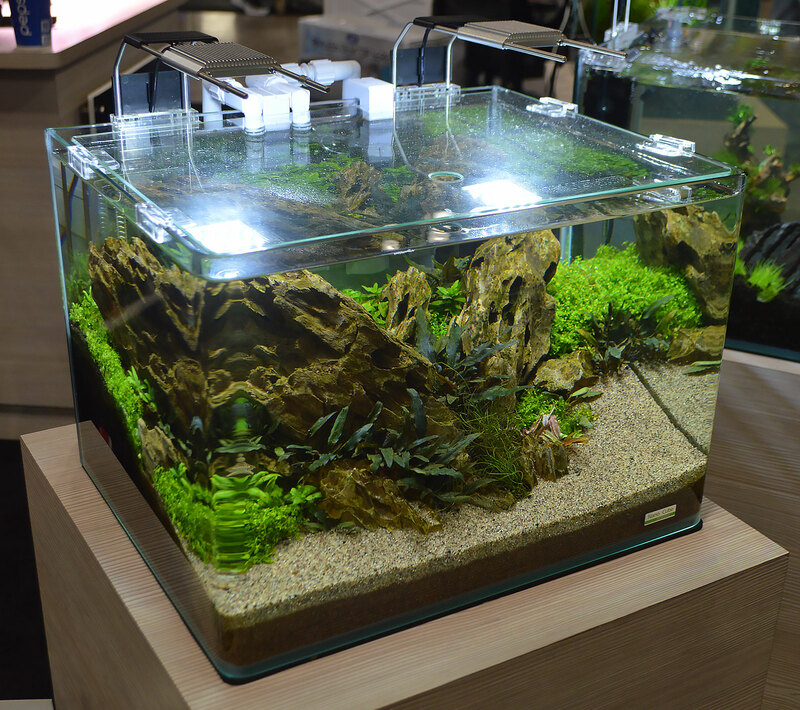 You can see a full-tank shot of this impressive aquascape at the Fluval booth further down in our pictorial review. Our coverage of the Aquatic Experience – Chicago continues. Held in Schaumburg, IL, the Aquatic Experience – Chicago is an event put on by the World Pet Association (WPA). 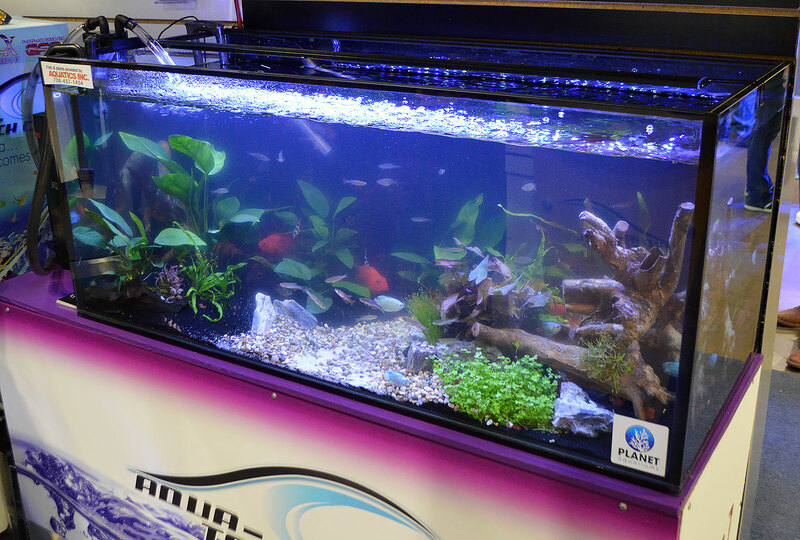 It promotes the aquarium-keeping hobby and is open to the general public. 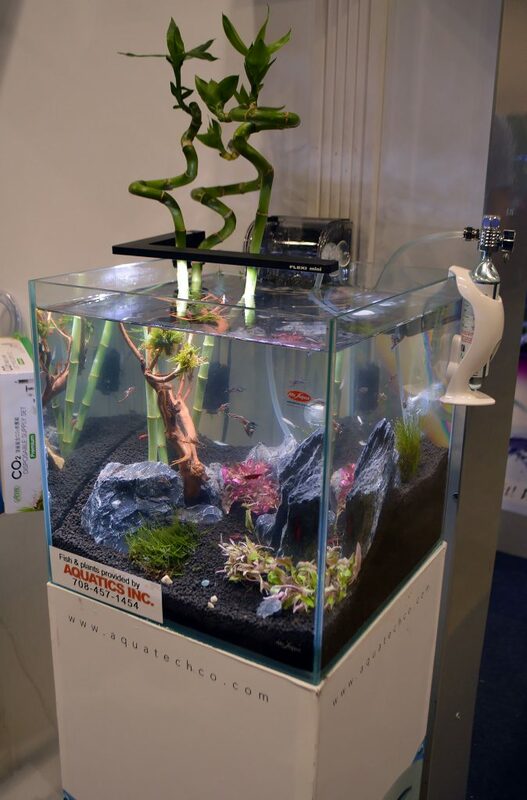 As we’ve posted already, this family-friendly three-day event had much to offer, including the Aquascaping Live! competition for both large aquariums designed by teams, and individual competition for small aquarium aquascaping. New products were introduced to the industry and hobby. 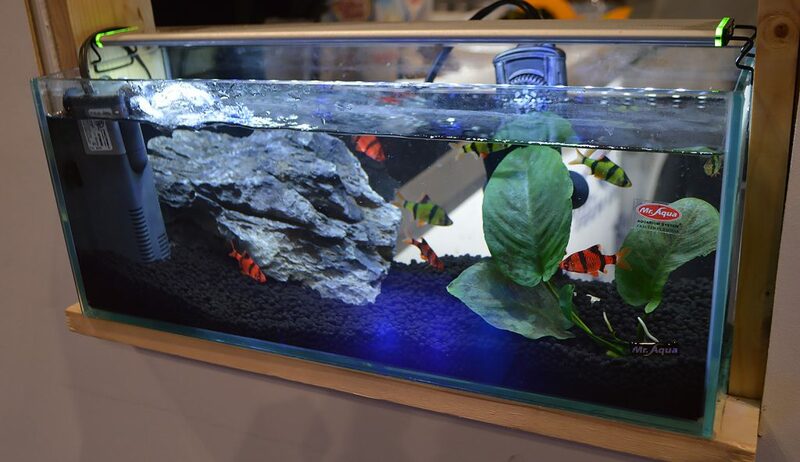 The show floor was filled with vendors showing off the latest in marine aquaria and livestock. But, as we noted in Part 1 of this pictorial review, freshwater aquariums dominated the vendor displays. 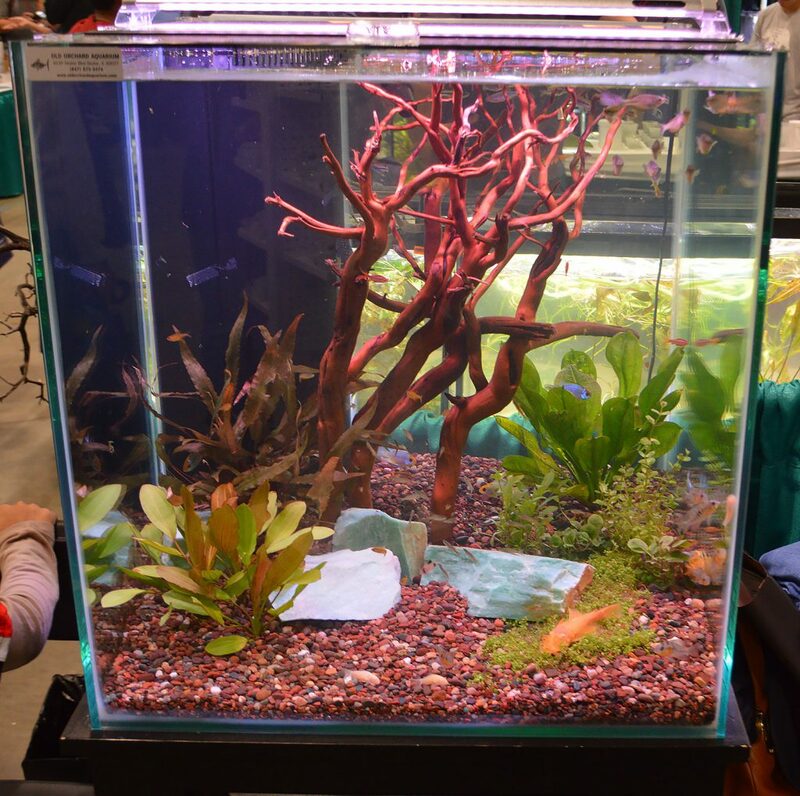 I left the event with an overwhelming sense that the well-planted, well-aquascaped freshwater aquarium—what I like to call the “reef tank of the freshwater hobby”—has officially become a mainstream interest in the US. Perhaps rightfully so. 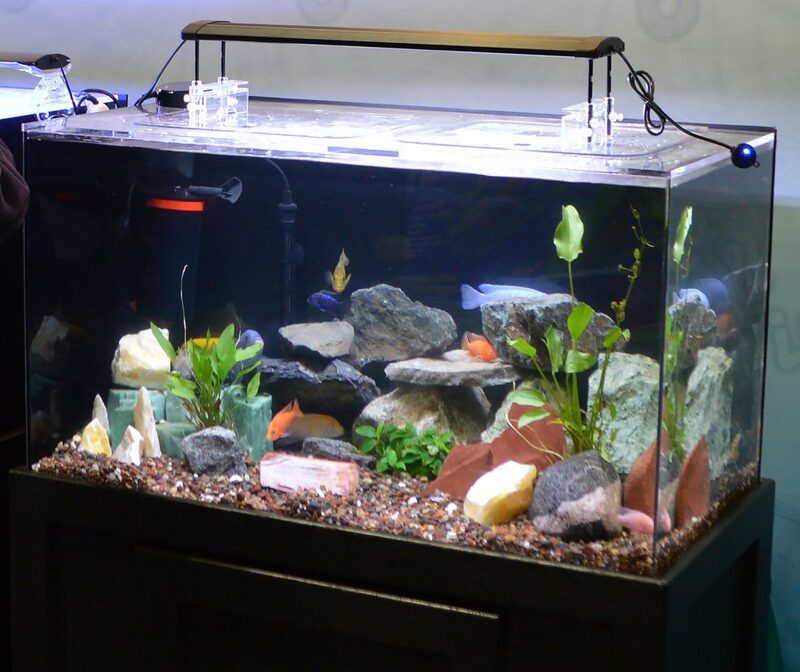 The use of real, live plants in an aquarium always looks better and seems to foster a healthier environment for our fish, but for me growing up as an aquarist, live plants seemed like an outlier to the overall hobby. I think it’s fair to say we owe Takashi Amano a lot of the credit for sparking the planted tank revolution, but it’s gone well beyond Amano. Enthusiasts have refined the keeping of planted tanks, making it easier and more accessible. The preponderance of tissue-cultured plants helps the hobby enter a new realm, where plant pests arguably could be a thing of the past, and the diversity of plants available to underwater gardeners has never been greater. I have to check myself when I look at a tiny piece of Bucephalandra selling for $25 and I think that’s “expensive”—if I ever head down that path of thinking, remind me of the Zoanthids that sell for $10, $20, $50, or $1000 per polyp. 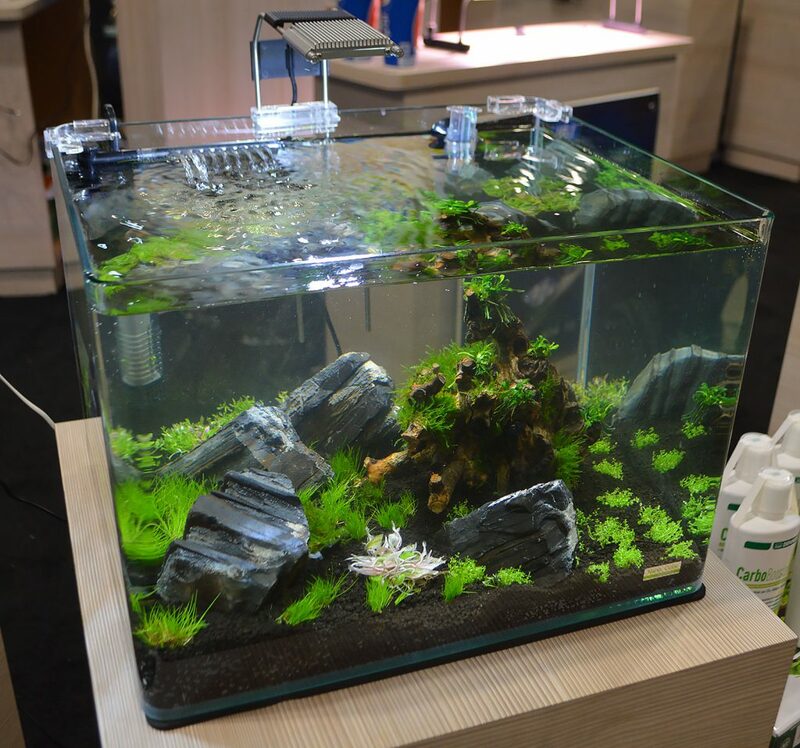 The laws of supply and demand still apply in the trade of aquarium life, and freshwater plants certainly aren’t excluded. 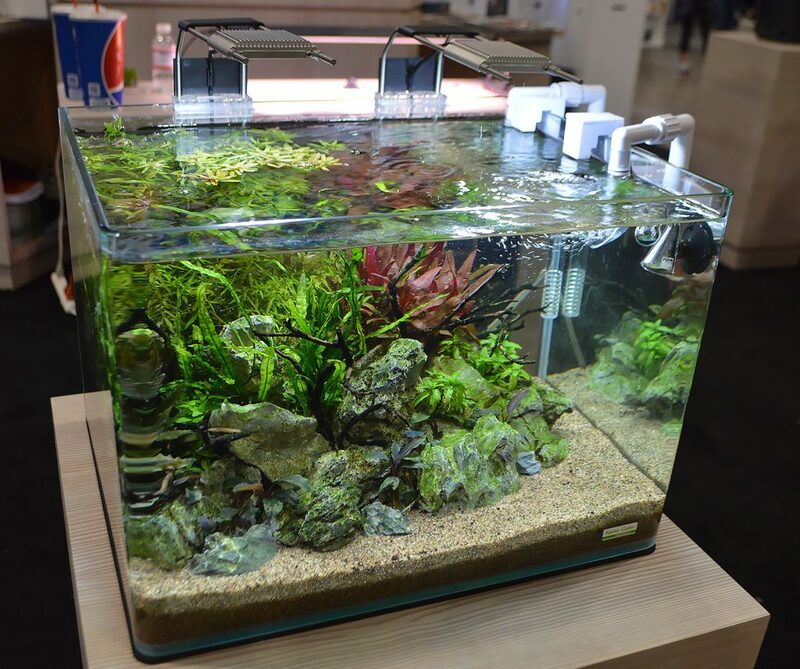 Seeing so many tanks with live plants, and so much plant diversity, it is clear which way the freshwater aquarium is headed. I hope it brings even more enthusiasm and a more polished image to the freshwater aquarium hobby, breathing new life and vigor into it. Over the years, I’ve been told by multiple people that a successful local fish shop needs inspiring displays, something makes customers’ jaws drop when they walk in. They instantly must have it; cost doesn’t matter. You have to inspire your customers. Well, between the aquascaping competition and the onslaught of gorgeous planted aquariums in the vendor booths, the Aquatic Experience fulfilled my “inspirational” mandate. Half a dozen cups of tissue-cultured plants are now sitting on my kitchen counter; hopefully I can find the time to steal away this weekend and set up one of my newest aquariums. I hope you enjoy the second and final installment of our Freshwater Tanks of the Aquatic Experience 2016 photo spread. I should note that, while comprehensive, this review may not have captured every freshwater aquarium at the show; if I missed one, it was purely a function of “not enough time”! And yet, there is still so much more to come. Nautilus Tropical Fish Wholesale had a beautiful display of freshwater predators, including Pike Cichlids, Peacock Bass, and freshwater Stingrays. 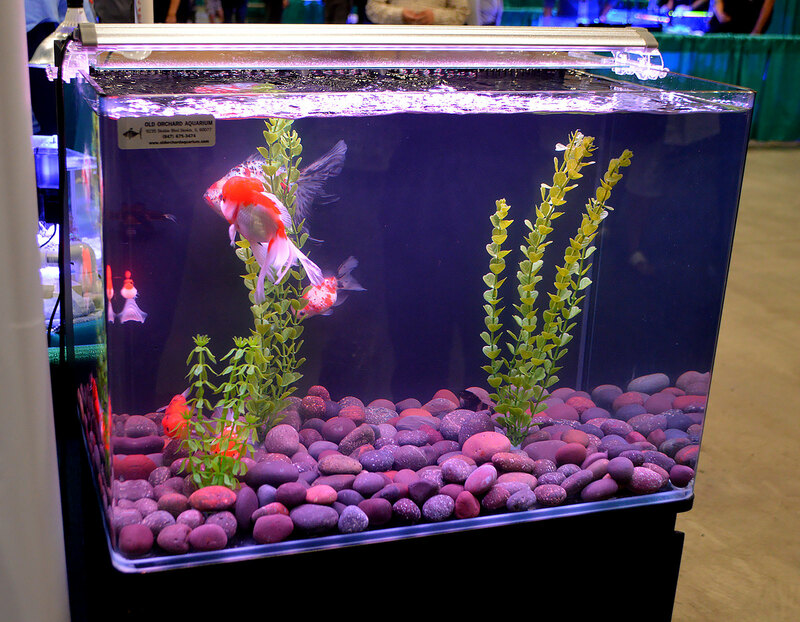 Aqua-Tech Co. had a couple small freshwater aquariums on display, including these genetically-modified GloFish Tiger Barbs. Another tank on display by Aqua-Tech Co, with Guppies and plants from Aquatics, Inc.
Aqua-Tech Co. also offered up this assemblage of typical community-type aquarium fishes from Aquatics, Inc., all housed in a tank by Planet Aquariums. 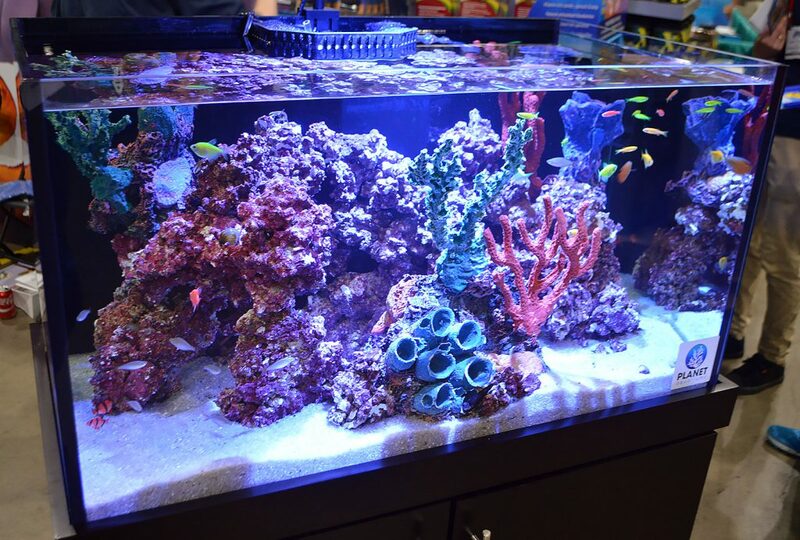 Freshwater fish cavort among artificial corals as Aquarium Adventure shows off a classic example of the “I want a saltwater tank, without the actual headaches of a saltwater tank” type of aquarium. For those who feel a certain reaction to the “fake coral, freshwater fish” aesthetic, Aquarium Adventure also presented this beautiful high-end planted tank in a Kithros model IFALOS aquarium from Elive. See more of this tank in our detailed look at the Kithros aquarium. 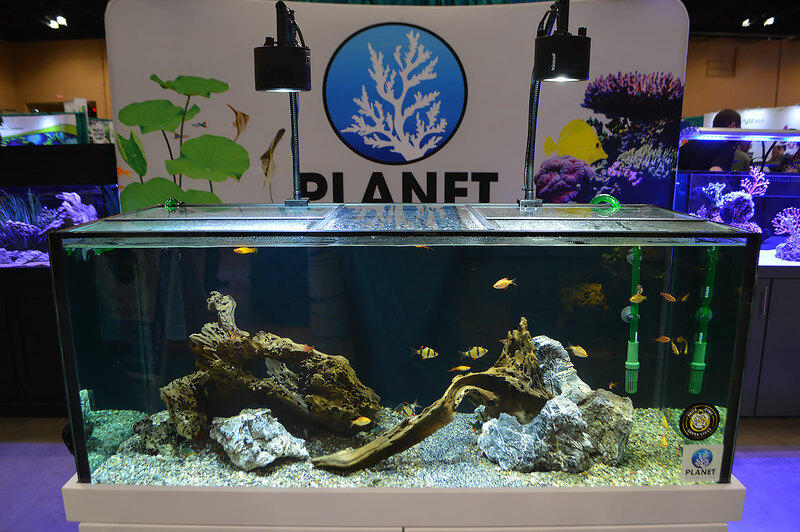 Florida Exotic Fish Sales and Xtreme Aquatic Foods presented a display featuring Tanganyikan Cichlids. 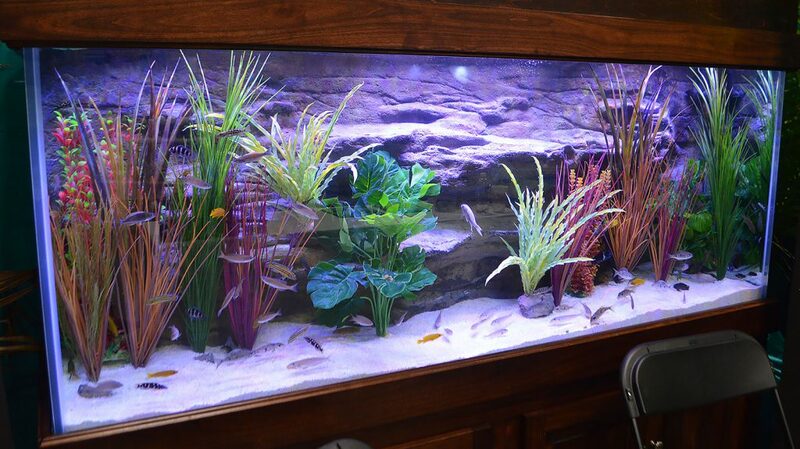 The Finnex both featured a rocky tank of African cichlids. 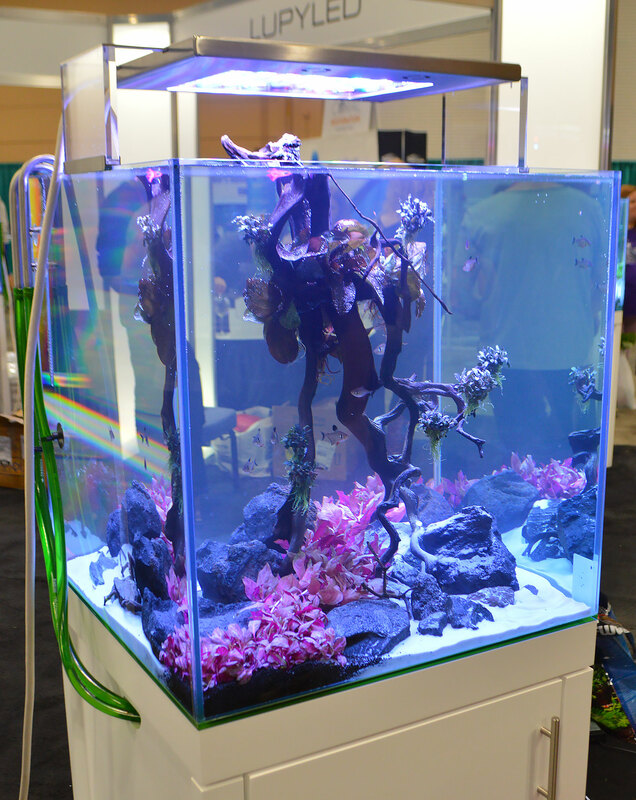 Kessil, an LED lighting company probably more familiar to reef aquarium hobbyists, offered up this planted aquarium featuring Angelfish and Tetras. 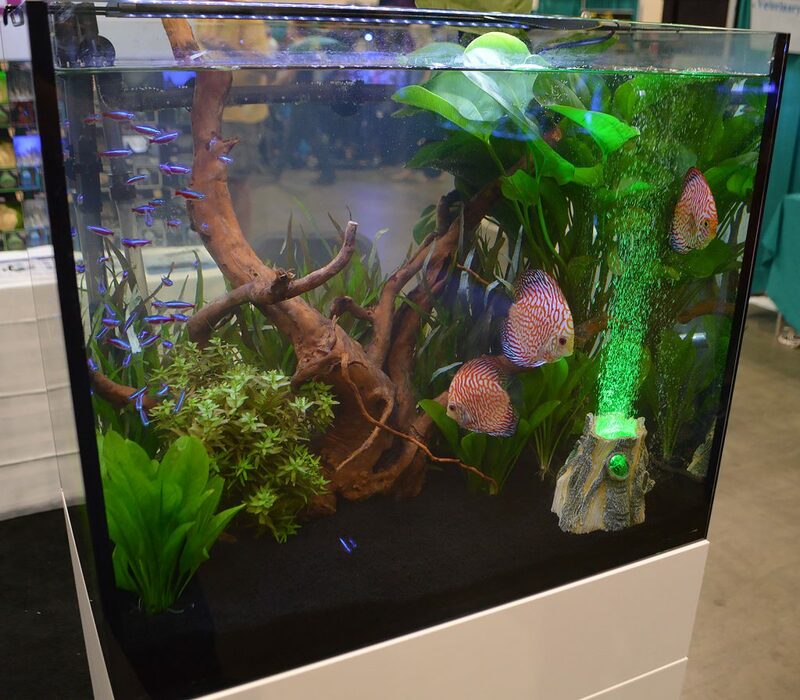 Hydor’s planted Discus aquarium was punctuated with a glowing LED air volcano. 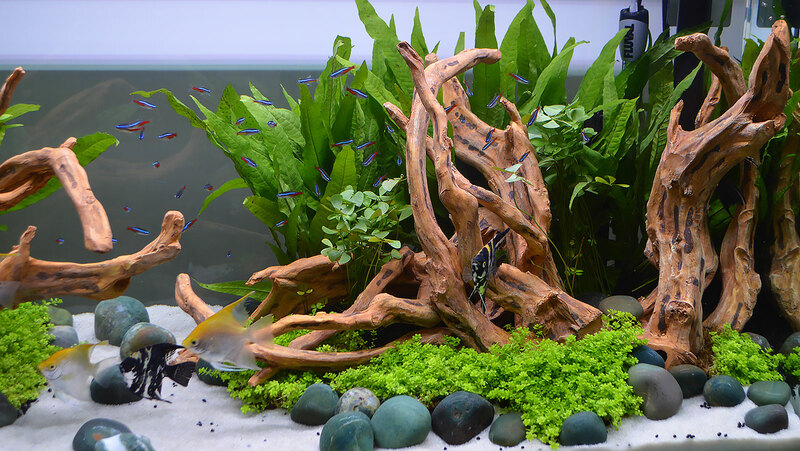 JBJ arguably “threw down” with four small, and stunning, freshwater planted aquascapes. Here’s the first aquarium. 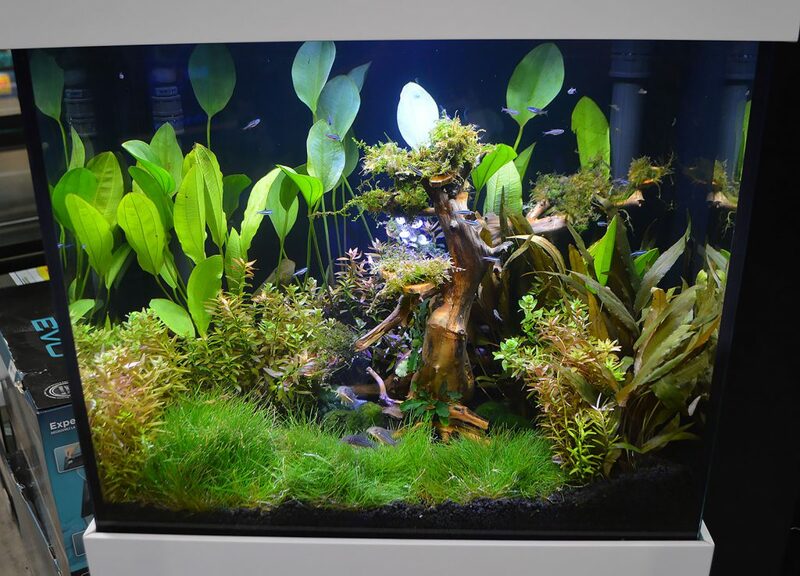 Update – we’ve learned this aquascape was designed by Bailin Shaw and John Pini, and grown out by Pini. 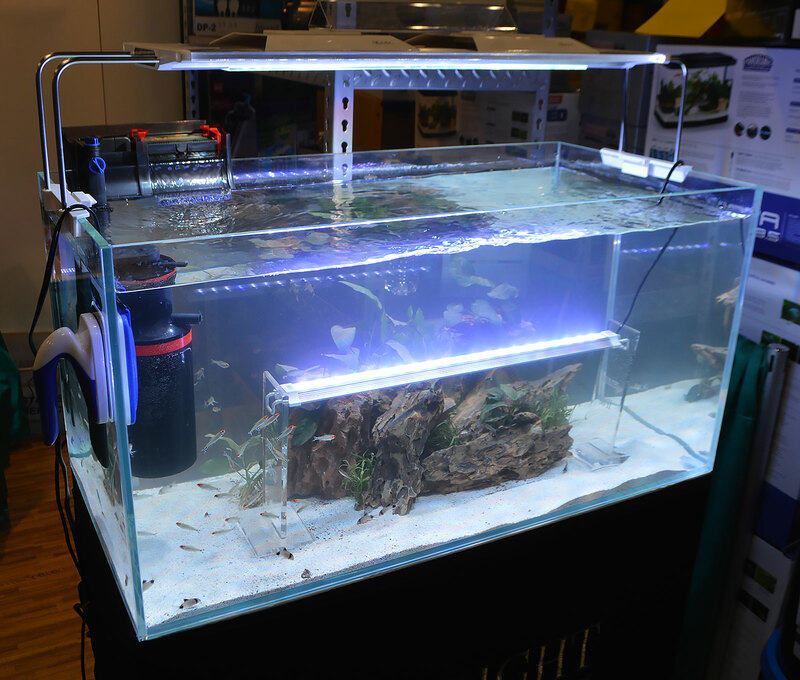 JBJ has teamed up with Dennerle, and they had multiple Dennerle products incorporated into their freshwater displays, such as the LED lighting and filtration on this co-branded Nano Cube / Dennerle tank. 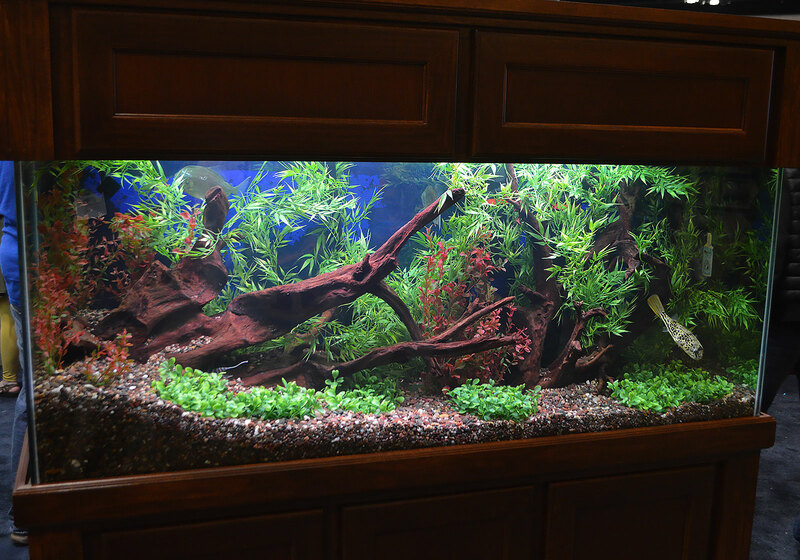 Update – we’ve learned aquascape credits go to Bailin Shaw for design, and Jo Ann Fujii for maintaining! 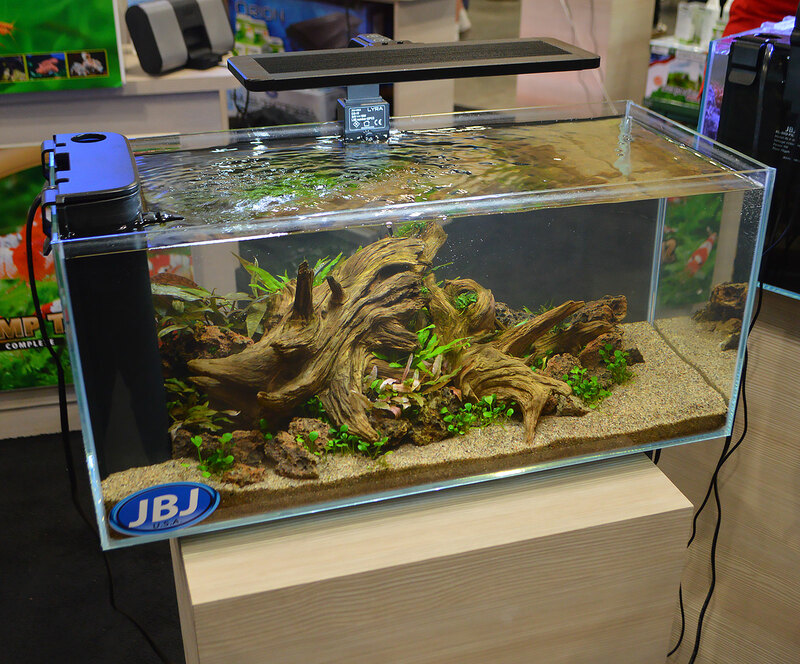 Another nano planted aquarium from JBJ. 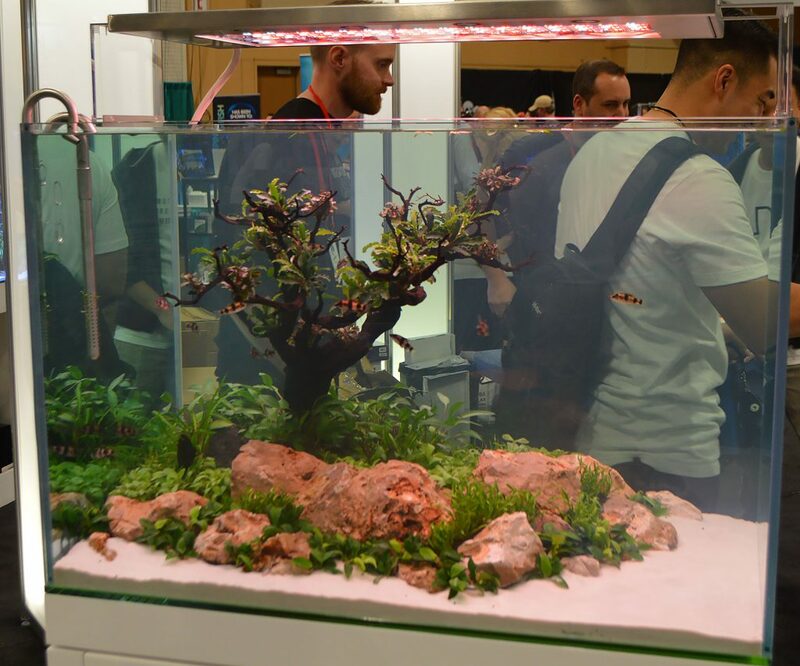 A lush, established planted aquarium, again featuring Dennerle components as part of JBJ’s display. 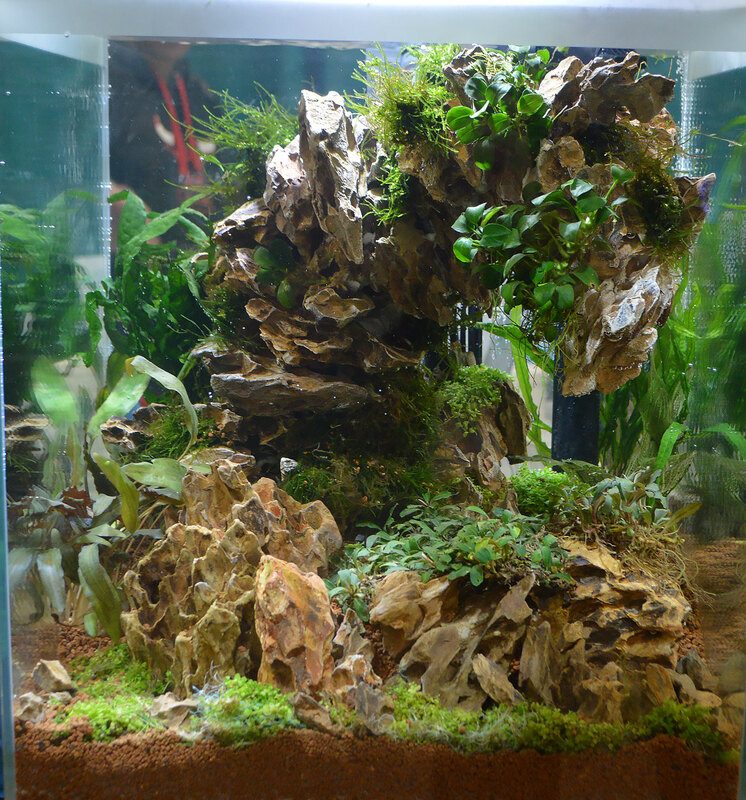 Update – Bailin Shaw gets credit for designing and maintaining this aquascape. Aqvainnova and LUPYLED shared a joint display and had well-known aquascapers Luis Navarro, Oliver Knott, and the Senske Brothers (from Aquarium Design Group) on hand to talk with attendees and provide real-time aquascaping demonstrations in the booths. One of two tanks designed by Jeff Senske from ADG, this one featuring a shoal of Melon Barbs, Haludaria fasciata. 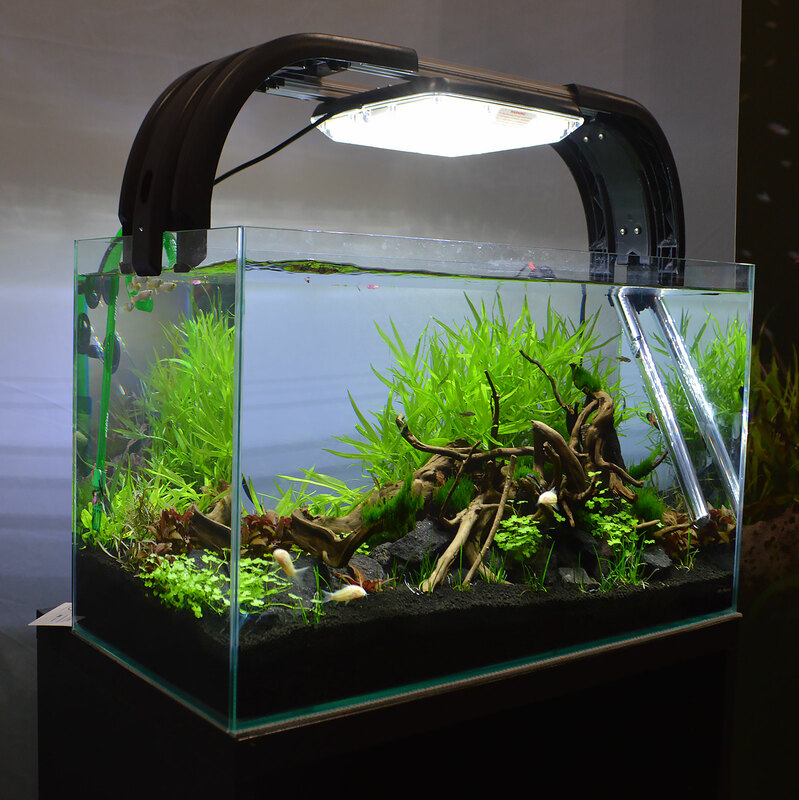 Aquatropic and Tropica Aquarium Plants teamed up to showcase a few tanks as well. This little gem is supposedly the result of just two weeks of plant growth from 6 tissue culture cups. Makes a reef tank seem downright glacial by comparison. Another tank at the Aquatropic booth, this one set up by Old Orchard Aquarium. This Goldfish aquarium, set up by Old Orchard Aquarium at the Aquatropic booth, actually grabbed a lot of attention from passersby. 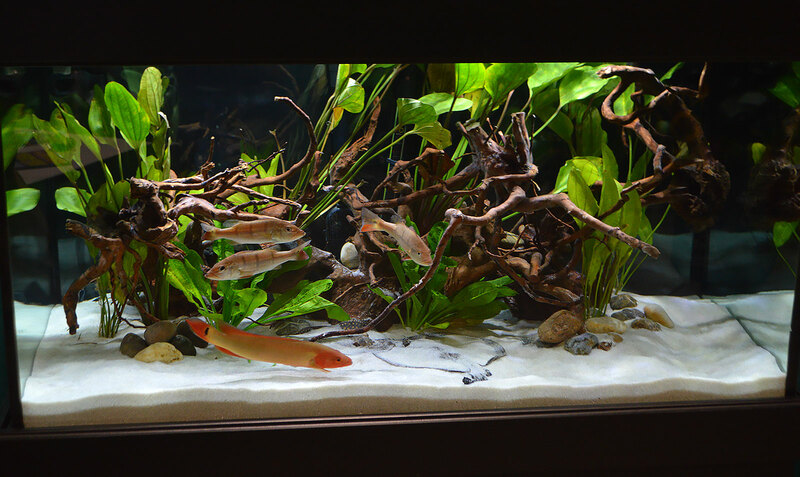 Don’t discount the allure of a simple setup with the hobby’s oldest “designer” fishes. Dustin’s Fishtanks had multiple aquariums on display, including this curved-front aquarium. Another aquarium in the Dustin’s Fishtanks booth featured this curving, arching, almost falling-over leaning tower of stacked rock. It made for a very unusual and intriguing display. 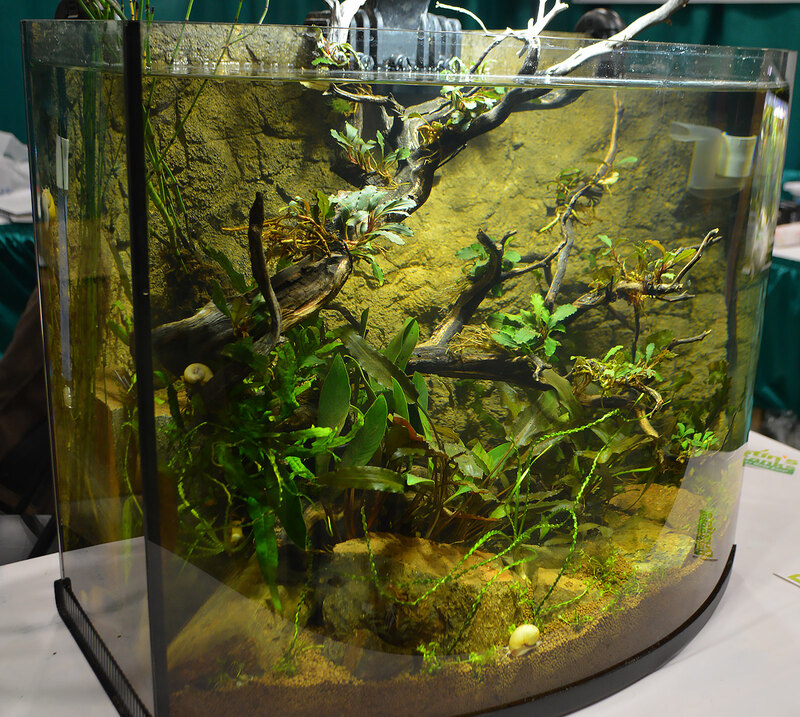 A somewhat formal-looking heavily planted aquarium was on display at the Pecan Grove Solutions booth. Planet Aquariums offered a respite from the onslaught of green with this hardscape. While perhaps not aesthetically very pleasing, this functional display by Ming Trading gets the point across. 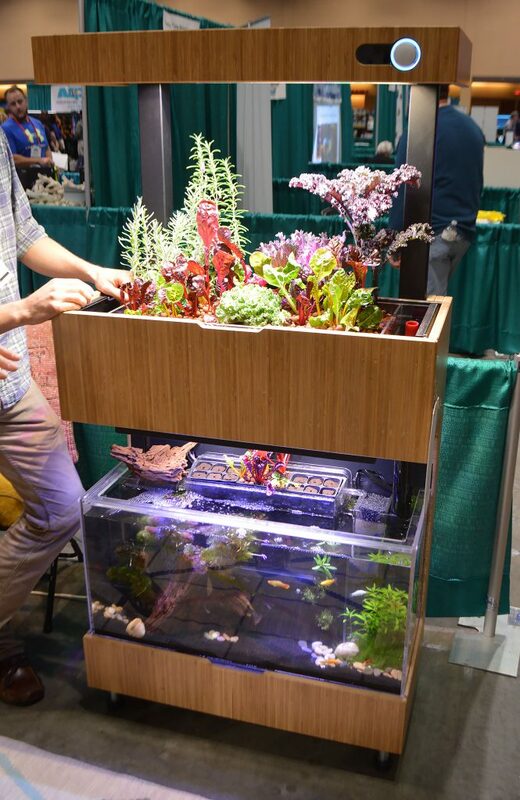 Aquaponics had a stylish presence at the Aquatic Experience; this unit is offered by Grove. The pufferfish in this Marineland display was interacting with guests all day. Be sure to check out Part 1 if you inadvertently came to this installment first. 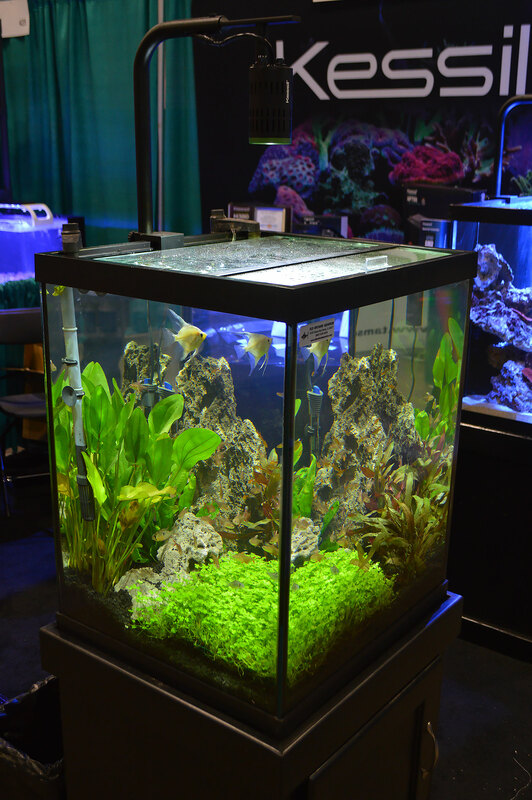 This wraps up our pictorials of the many aquariums on display at the 2016 Aquatic Experience – Chicago, but yes, there’s still more to come, including new products, a few in-depth looks at some of my personal favorite tanks from the show, and perhaps even a fish photo spread. So, what was your favorite? Tell us in the comments below!